From the Institute of Neuropathology (N.K., L.M., U.-K.H., W.B. ), University Medical Center Göttingen, Germany; and Teva Pharmaceutical Industries (L.H. ), Netanya, Israel. Objective: To test whether Toll-like receptor (TLR) signaling plays a key role for reduced nuclear factor B (NF-κB) activation after laquinimod treatment in the model of cuprizone-induced demyelination, oligodendrocyte apoptosis, inflammation, and axonal damage. Methods: Ten-week-old C57BL/6J, TLR4−/−, and MyD88−/− mice received 0.25% cuprizone for 6 weeks and were treated daily with 25 mg/kg laquinimod or vehicle. After 6 weeks of demyelination, extent of demyelination, oligodendrocyte density, microglia infiltration, and axonal damage were analyzed in the corpus callosum. Additionally, we analyzed primary mouse astrocytes from C57BL/6J, TLR4−/−, MyD88−/−, and TRIF−/− mice for alteration in NF-κB signaling. Results: Vehicle-treated controls from C57BL/6J, TLR4−/−, and MyD88−/− mice displayed extensive callosal demyelination as well as microglial activation. In contrast, mice treated with 25 mg/kg laquinimod showed mainly intact callosal myelin. The demyelination score was significantly higher in all untreated mice compared to mice treated with laquinimod. There were significantly fewer APP-positive axonal spheroids, Mac3-positive macrophages/microglia, and less oligodendrocyte apoptosis in the corpus callosum of laquinimod-treated mice in comparison to untreated controls. Stimulated primary mouse astrocytes from laquinimod-treated groups show reduced NF-κB activation compared to vehicle-treated controls. Conclusions: Our results confirm that laquinimod prevents demyelination in the cuprizone mouse model for multiple sclerosis via downregulation of NF-κB activation. This laquinimod effect, however, does not involve upstream Toll-like receptor signaling. Toll-like receptor (TLR) stimulation is a major and potent inducer upstream of the NF-κB signaling pathway. TLRs recruit adapter proteins with Toll-IL-1 receptor (TIR) domain containing adapter myeloid differentiation primary response 88 (MyD88) and the adapter molecule TIR domain containing adapter inducing interferon-γ (TRIF),11 resulting in downstream activation of NF-κB (figure 1).10,12 To address the question whether TLR signaling is essential for downstream activation of NF-κB, we studied the effect of laquinimod treatment in transgenic mice and primary mouse astrocytes lacking important TLR signaling components. At the cell surface, TLRs bind to their respective ligands. 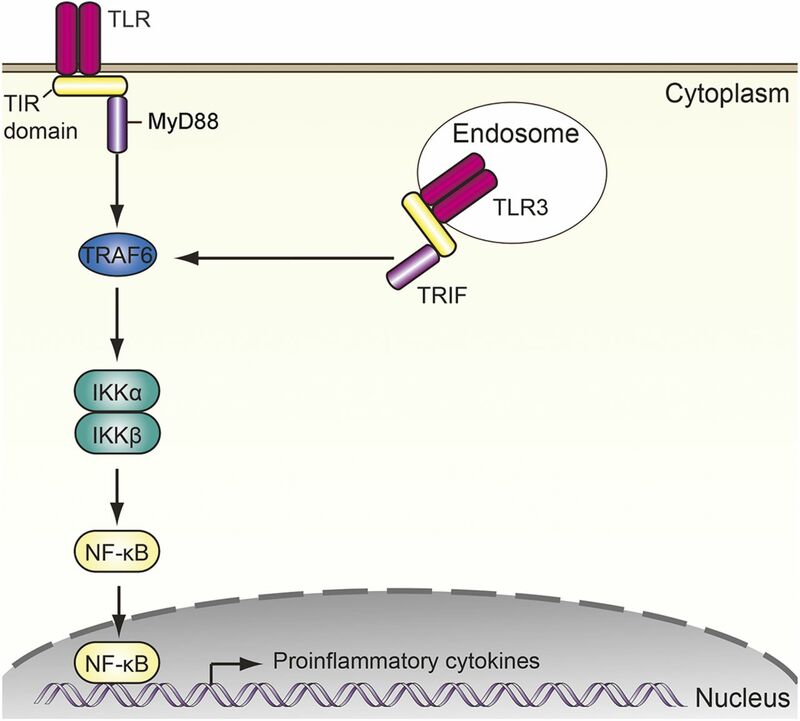 TLR3 is localized at endosomes, where they sense host-derived or microbial nucleic acids. TLR4 can be localized at both the plasma membrane and the endosomes. After ligand-induced dimerization of receptors, TLR signaling is initiated. Afterwards, Toll-IL-1 receptor (TIR) domain-containing adaptor proteins are engaged: either myeloid differentiation primary response 88 (MyD88) or Toll-IL-1 receptor domain containing adapter inducing interferon-γ (TRIF), leading to stimulation of downstream signaling pathways involving tumor necrosis factor receptor-associated factor (TRAF). One important transcription factor downstream of TLR signaling is NF-κB. In resting conditions, NF-κB dimers in the cytoplasm are bound to their inhibitor of κB (IκB) proteins. After activation, the IκB kinase (IKK) complex phosphorylates IκB proteins, leading to their polyubiquitinilation and degradation by the proteasome. NF-κB is then released from its inhibitor, translocates to the nucleus, and exerts its transcriptional activity. A major consequence of TLR signaling is the induction of proinflammatory cytokines. Laquinimod (originally ABR-215062) (RLB#054 M0004) was synthesized at Teva Pharmaceutical Industries (Petah Tikva, Israel). Mice were treated daily with 25 mg/kg laquinimod administered by oral gavage from the beginning of the cuprizone feeding. This dose has previously been shown to protect mice from cuprizone-induced demyelination.10 Cuprizone and laquinimod treatment was given for 6 weeks. Control mice received water as vehicle. In vitro, cell cultures were treated with 250 nm laquinimod or with vehicle as described below. Transgenic TLR4−/−, MyD88−/− mice were obtained from the animal facility at the University of Göttingen or from The Jackson Laboratory (Bar Harbor, ME). TRIFlps2 mice were provided by Bruce Beutler, La Jolla, California. The latter mice have a frameshift error mutation in the C-terminus of TRIF, resulting in abrogated TRIF function,13 and homozygous mice are from now on referred to TRIF−/−. Wild-type (WT) C57BL/6 mice were obtained from Charles River Laboratories (Sulzfeld, Germany). All animal experimentation was carried out in accordance with the European Council Directive of September 2010 (2010/63/EU) and was approved by the Lower Saxony Federal State Office for Consumer Protection and Food Safety, Germany. Toxic demyelination was induced by cuprizone (oxalic bis[cyclohexylidenehydrazide]; Sigma-Aldrich, Germany). 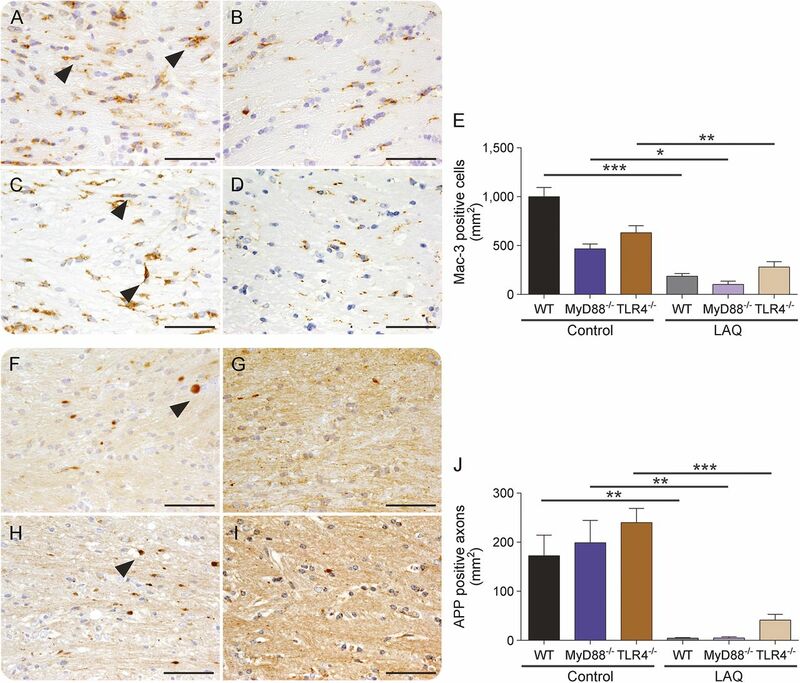 Ten-week-old WT, TLR4−/−, and MyD88−/− mice received a cuprizone diet of 0.25% cuprizone ad libitum for 6 weeks to study demyelination of the corpus callosum. Body weights of mice were controlled once weekly. After 6 weeks of cuprizone diet, mice were perfused with 4% paraformaldehyde. Brains were postfixed and embedded in paraffin. To determine demyelination, histologic evaluation was performed on sections stained with Luxol fast blue–periodic acid–Schiff (LFB-PAS). Immunohistochemistry was performed with primary antibodies against activated microglia (Mac-3, 1:200, clone M3/84; BD Pharmingen, San Jose, CA), oligodendrocytes (p25, 1:500, clone EPR3316; Abcam, Cambridge, UK),14 and acutely damaged axons (amyloid precursor protein [APP], 1:2,000, clone 22C11; Millipore, Billerica, MA). Cell culture and laquinimod treatment. Primary astrocytic cultures from newborn mice were prepared as described previously.10 Astrocytic cell cultures were preincubated with 250 nM laquinimod for 2 hours. Afterwards, they were treated with the combination of 10 ng/mL interleukin-1β (IL-1β) and 10 ng/mL interferon-γ (IFN-γ) for 1 hour in order to perform the NF-κB reporter assay in the absence and presence of laquinimod. Demyelination of the corpus callosum was assessed on LFB-PAS-stained sections using a semiquantitative scoring system as previously described10: no demyelination (0), <33% demyelination (1), 33%–66% demyelination (2), >66% demyelination (3). The densities of p25-positive oligodendrocytes, Mac-3-positive cells, and APP-positive axons were quantified. Statistical analysis was carried out using GraphPadPrism (version 5.01, GraphPad Software; La Jolla, CA). Histologic differences between laquinimod-treated and control mice were analyzed using one-way analysis of variance followed by Tukey multiple comparison test for parametric and Dunn multiple comparison test for nonparametric data. Statistical significance was defined as p < 0.05. Laquinimod reduces cuprizone-induced demyelination and oligodendrocyte loss. Feeding of cuprizone induces subsequent demyelination and oligodendrocyte apoptosis. To test whether the protective effect of laquinimod is TLR-dependent, WT, TLR4−/−, and MyD88−/− mice received a daily dose of 25 mg/kg laquinimod during 6 weeks of cuprizone-induced demyelination. In each group, demyelination was evaluated in the corpus callosum. 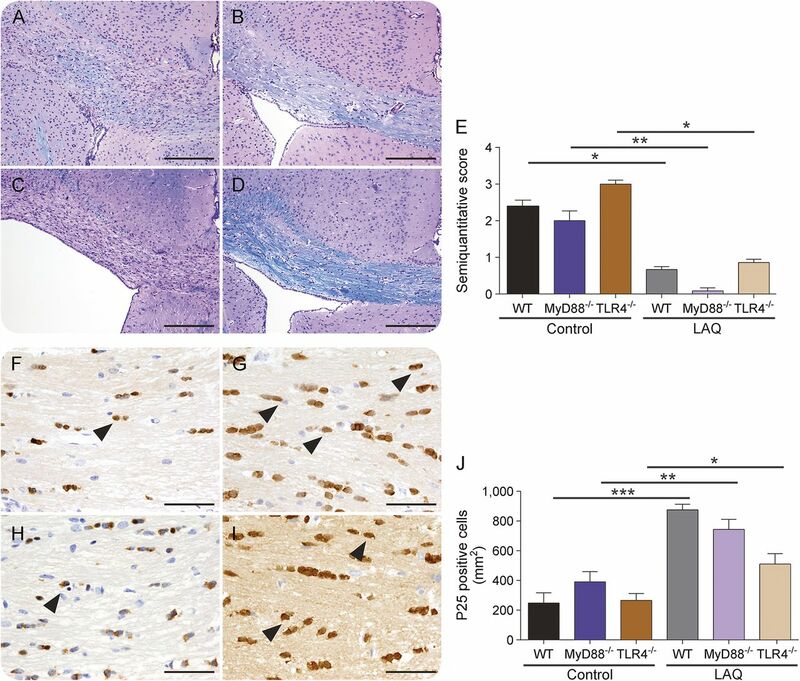 Untreated WT, TLR4−/−, and MyD88−/− mice displayed extensive callosal demyelination (figure 2, A, C, and E), whereas WT, TLR4−/−, and MyD88−/− mice treated with 25 mg/kg laquinimod showed mainly intact callosal myelin with only minor signs of demyelination (figure 2, B, D, and E). Demyelination scores were higher in vehicle-treated mice (WT: 2.38 ± 0.18, n = 10; MyD88−/−: 2.00 ± 0.18, n = 8; TLR4−/−: 3.00 ± 0.10, n = 7) than in mice treated with laquinimod (WT: 0.69 ± 0.09, n = 9, p < 0.05; MyD88−/−: 0.08 ± 0.07, n = 6, p < 0.001; TLR4−/−: 0.86 ± 0.09, n = 7, p < 0.05) (figure 2E). Demyelination is extensive in the corpus callosum of vehicle-treated wild-type (WT) mice (A) and myeloid differentiation primary response 88 (MyD88−/−) mice (C) compared to moderate demyelination after treatment with laquinimod in WT (B) and MyD88−/− mice (D). In all groups, mice treated with laquinimod displayed lower demyelination scores than vehicle-treated controls (E). Staining for p25+ oligodendrocytes revealed reduced oligodendrocyte numbers in vehicle-treated WT (F) and MyD88−/− (H) mice compared to mice treated with laquinimod (G, I). In all groups, mice treated with laquinimod displayed higher p25+ oligodendrocyte numbers than vehicle-treated controls (J) (scale bars 200 μm [A–D], 50 μm [F–I]) (*p < 0.05; **p < 0.01; ***p < 0.005 with Tukey multiple comparison). Black arrowheads mark exemplary p25+ oligodendrocytes. TLR = Toll-like receptor. Cuprizone induces oligodendroglial apoptosis. To assess if the effect of laquinimod on oligodendroglia density after cuprizone challenge is dependent on TLR signaling, we analyzed WT (figure 2, G and I), TLR4−/−, and MyD88−/− (figure 2, F and H) mice treated with laquinimod (figure 2, B and D) or vehicle (figure 2, A and C). After 6 weeks of cuprizone, mice treated with laquinimod show higher p25-positive oligodendrocyte numbers (WT: 875.59 ± 33.42, n = 9, p < 0.001; MyD88−/−: 743.57 ± 68.03, n = 6, p < 0.005; TLR4−/−: 510.36 ± 70.38, n = 6, p < 0.05) compared to vehicle-treated controls (WT: 247.74 ± 69.45, n = 6; MyD88−/−: 390.89 ± 68.97, n = 7; TLR4−/−: 265.44 ± 56.79, n = 12) (figure 2J). Laquinimod reduces microglia activation and acute axonal damage. Accumulation of microglia was investigated by Mac-3 staining. Microglia were evaluated within the corpus callosum of WT (figure 3, A and B), TLR4−/−, and MyD88−/− (figure 3, C and D) mice treated with laquinimod (figure 3, B and D) or vehicle (figure, 3 A and C). The microglia density was reduced during laquinimod treatment (WT: 170.19 ± 27.92, n = 9; MyD88−/−: 102.14 ± 33.64, n = 5; TLR4−/−: 279.08 ± 55.75, n = 7) compared to vehicle-treated controls (WT: 990.33 ± 94.13, n = 10, p < 0.001; MyD88−/−: 465.45 ± 50.74, n = 7, p < 0.05; TLR4−/−: 517.06 ± 73.11, n = 13, p < 0.005) (figure 3E). Microglia infiltration is extensive in the corpus callosum of vehicle-treated wild-type (WT) (A) and myeloid differentiation primary response 88 (MyD88−/−) mice (C) compared to moderate microglia infiltration after treatment with LAQ in WT (B) and MyD88−/− mice (D). In all analyzed groups, mice treated with LAQ displayed lower numbers of Mac-3+ microglia cells than vehicle-treated controls (E). Staining for amyloid precursor protein (APP)+ axonal spheroids displayed higher numbers in vehicle-treated WT (F) and MyD88−/− (H) mice compared to mice treated with LAQ (G, I). In all analyzed groups, mice treated with LAQ displayed lower numbers of APP+ axons than vehicle-treated controls (J) (scale bars 50 μm) (*p < 0.05; **p < 0.01; ***p < 0.005 with Tukey multiple comparison). Black arrowheads mark exemplary Mac-3+ microglia and APP+ axonal spheroids. TLR = Toll-like receptor. To determine the effect of laquinimod on axonal integrity, we analyzed acutely damaged axons characterized by swelling and accumulation of the APP. APP-positive axons were evaluated within the corpus callosum of WT (figure 3, F and G), TLR4−/−, and MyD88−/− (figure 3, H and I) mice treated with laquinimod (figure 3, G and I) or vehicle (figure 3, F and H). There was a reduction of acute axonal damage under laquinimod (WT: 4.45 ± 1.10, n = 9; MyD88−/−: 4.64 ± 2.40, n = 6; TLR4−/−: 41.00 ± 11.99, n = 7) compared to vehicle-treated controls (WT: 172.36 ± 42.09, n = 8, p < 0.005; MyD88−/−: 198.93 ± 45.35, n = 8, p < 0.005; TLR4−/−: 239.87 ± 29.07, n = 13, p < 0.001) (figure 3J). Laquinimod downmodulates astrocytic NF-κB activation in vitro. Since our previous investigations showed a protective effect of laquinimod through regulation of astrocytic NF-κB activation, we further analyzed the effect of laquinimod treatment in primary astrocytes of WT and TLR signaling deficient mice. To directly assess the in vitro effect of laquinimod on astrocytic NF-κB activity, we stimulated isolated mouse astrocytes with a combination of IL-1β and IFN-γ. We examined NF-κB activation with and without laquinimod pretreatment. Without laquinimod exposure, the cytokine treatments increased NF-κB activation compared to unstimulated controls (all groups were normalized to unstimulated controls). The pretreatment with laquinimod reduced the stimulation-induced NF-κB activation (WT: 6.12 ± 0.89; MyD88−/−: 6.28 ± 0.75; TLR4−/−: 5.87 ± 0.77; TRIF−/−: 3.94 ± 0.62) compared to vehicle-treated controls (WT: 15.94 ± 1.13; MyD88−/−: 15.10 ± 0.84; TLR4−/−: 14.16 ± 0.87; TRIF−/−: 9.48 ± 0.77) (n = 3, p < 0.005) (figure 4) in all analyzed mouse strains. Pretreatment with laquinimod reduces NF-κB activity in stimulated primary mouse astrocytes. Transfected cells were pretreated with 250 nM laquinimod and stimulated with interleukin-1β and interferon-γ. NF-κB activity was measured luminometrically (relative light units [RLU]). In all groups, pretreatment with laquinimod reduces NF-κB activation after cytokine stimulation (all groups were normalized to unstimulated controls) (***p < 0.005). MyD88 = myeloid differentiation primary response 88; TLR = Toll-like receptor; TRIF = Toll-IL-1 receptor domain containing adapter inducing interferon-γ; WT = wild-type. Laquinimod is a new oral immunomodulator that has demonstrated in 2 phase III, placebo-controlled studies (Assessment of Oral Laquinimod in Preventing Progression in Multiple Sclerosis [ALLEGRO] and A phase III Trial of Niraparib Versus Physician's Choice in HER2 Negative, Germline BRCA Mutation-positive Breast Cancer Patients [BRAVO]) that 0.6 mg laquinimod daily was associated with a 34% reduction in 3-month confirmed disability progression (CDP) and a 46% reduction in 6-month CDP. The positive effect on CDP is disproportionately larger than it would be predicted by the effect on relapse rate reduction. These clinical studies suggested a more extensive direct CNS protective effect of laquinimod than peripheral immunomodulation. This hypothesis was confirmed in previous experimental studies identifying astrocytes and microglial cells as the main target of laquinimod in the CNS and NF-κB downregulation as one of the major mechanisms of action. Here we show that the effect of laquinimod is independent of TLR signaling, which is one of the major pathways leading to downstream NF-κB activation. It was recently shown that pretreatment of lipopolysaccharide (LPS)–activated human microglia with laquinimod regulates proinflammatory and anti-inflammatory gene expression through TLR signaling in vitro. Reduced activation of human microglia after pretreatment with laquinimod for 24 hours was observed. In this study, laquinimod affected the activation of human microglia by TLR2 and TLR4 signaling in vitro.15 Therefore, we investigated whether there is a relationship between reduced NF-κB activation after laquinimod treatment and the TLR signaling pathway in vivo and in vitro. NF-κB can be activated by both MyD88-and TRIF-dependent pathways.16 MyD88-deficient macrophages and embryonic fibroblasts fail to produce inflammatory cytokines and in these cells NF-κB activation is delayed in response to LPS.17 TRIF-deficient cells show reduced production of inflammatory cytokines but early NF-κB activation.18 These data indicate that both MyD88-and TRIF-dependent pathways are required for production of inflammatory cytokines. 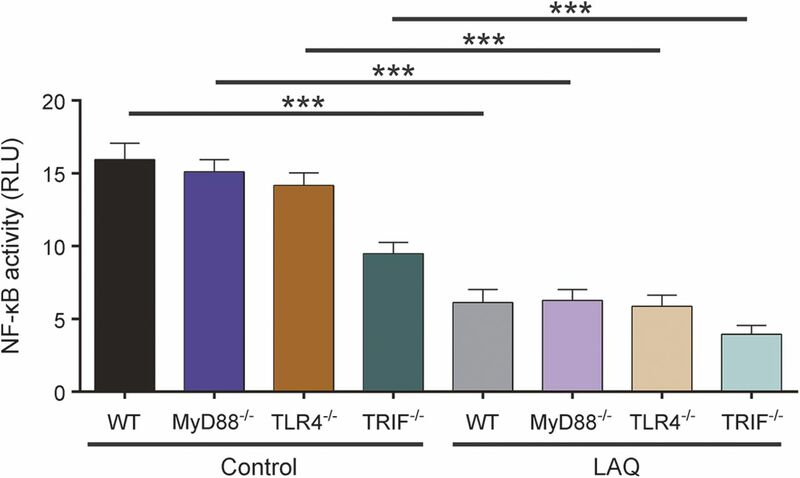 All TLRs are able to activate NF-κB through the MyD88-dependent or TRIF-dependent pathways or both.16 However, a complete loss of NF-κB activation in the absence of MyD88 and TRIF is observed in response to LPS indicating that TRIF-dependent pathways control late phase NF-κB activation.18 In contrast to laquinimod, other medications used for the treatment of MS have been shown to depend at least partly on TLR signaling. Glatiramer acetate effects on innate immune cells are blocked by TRIF deficiency; however, its effects were independent of MyD88 and NF-κB.19 The different and distinct mechanisms of action of these 2 compounds makes them reasonable candidates for future combination treatment approaches in MS.
We investigated TLR4-deficient and MyD88-deficient mice in vivo and TLR4-deficient, MyD88-deficient, and TRIF-deficient astrocytes in vitro. This is the first study excluding the effect of TLR signaling and its downstream effector molecules (MyD88 and TRIF) to play a role in reduced NF-κB activation after laquinimod treatment. Feeding the copper chelator cuprizone leads to toxic demyelination in the brain of mice. Cuprizone induces oligodendroglial apoptosis and subsequent demyelination, which is not characterized by inflammation or blood–brain barrier breakdown.20 Laquinimod treatment significantly reduced demyelination after 6 weeks of cuprizone. Mice treated with laquinimod showed mainly intact myelin compared to almost complete demyelination in untreated controls. The effect was further associated with a reduced oligodendrocyte loss. Acute axonal damage was almost absent and reduced microglia infiltration was observed. In our previous study, we showed that these effects in WT mice were associated with reduced astrocytic NF-κB activation in vivo, indicated by reduced nuclear p65 translocation in callosal astrocytes, exactly paralleling the in vitro studies.10 Mice with TLR signaling deficiency showed the same protective effect of laquinimod. In line with our in vivo studies, we found no profound effect in the lack of TLR signaling on NF-κB activation after stimulation. All groups of stimulated primary mouse astrocytes showed reduced NF-κB activation after treatment with laquinimod independent of TLR signaling. Taken together, these experiments suggest that intact TLR signaling is not necessary for the protective effect of laquinimod on cuprizone-induced demyelination in vivo and in primary mouse astrocytes in vitro. Nadine Kramann: design or conceptualization of the study, analysis or interpretation of the data, drafting the manuscript. Lena Menken: analysis or interpretation of the data, drafting the manuscript. Liat Hayardeny: design or conceptualization of the study, revising the manuscript for intellectual content. Uwe-Karsten Hanisch: design or conceptualization of the study. Wolfgang Brück: design or conceptualization of the study, revising the manuscript for intellectual content. N. Kramann received travel funding and research support from Teva Pharmaceuticals. L. Menken received research support from Teva Pharmaceuticals. Liat Hayardeny is employed by and holds stock or stock options in Teva Pharmaceuticals. Uwe-Karsten Hanisch is deceased. W. Brück served on the advisory board for Genzyme, Novartis, Biogen, and Teva Pharmaceuticals; received speaker honoraria from Teva, Sanofi, Genzyme, Novartis, Merck-Serono, Biogen, and Bayer; is on the editorial board for Acta Neuropathologica, Therapeutic Advances in Neurological Disorders, Multiple Sclerosis International, and Neuropathology and Applied Neurobiology; received research support from Teva, Novartis, Bigoen, Genzyme, German Research Foundation, German Ministry for Science and Education, and Tschira Foundation; and served as an expert witness for Teva. Go to Neurology.org/nn for full disclosure forms. The authors thank Mareike Gloth for expert technical assistance.
. A critical appraisal of treatment decisions in multiple sclerosis: old versus new. Nat Rev Neurol 2011;7:255–262.
. Inflammation, demyelination, and degeneration: recent insights from MS pathology. Biochim Biophys Acta 2011;1812:275–282.
. Transcription factor NF-kappaB and inhibitor I kappaBalpha are localized in macrophages in active multiple sclerosis lesions. J Neuropathol Exp Neurol 1998;57:168–178.
. Activation of NF-kappaB and c-jun transcription factors in multiple sclerosis lesions. Implications for oligodendrocyte pathology. Am J Pathol 1999;155:1433–1438.
. Placebo-controlled trial of oral laquinimod for multiple sclerosis. N Engl J Med 2012;366:1000–1009.
. A phase 2, 24-week, randomized, placebo-controlled, double-blind study examining the efficacy and safety of an anti-interleukin-12 and -23 monoclonal antibody in patients with relapsing-remitting or secondary progressive multiple sclerosis. Mult Scler 2011;17:181–191.
. Insight into the mechanism of laquinimod action. J Neurol Sci 2011;306:173–179.
. The new orally active immunoregulator laquinimod (ABR-215062) effectively inhibits development and relapses of experimental autoimmune encephalomyelitis. J Neuroimmunol 2002;130:163–172.
. Laquinimod (ABR-215062) suppresses the development of experimental autoimmune encephalomyelitis, modulates the Th1/Th2 balance and induces the Th3 cytokine TGF-beta in Lewis rats. J Neuroimmunol 2004;156:3–9.
. Reduced astrocytic NF-kappaB activation by laquinimod protects from cuprizone-induced demyelination. Acta Neuropathol 2012;124:411–424.
. Toll-like receptor signalling. Nat Rev Immunol 2004;4:499–511.
. Toxicity of teriflunomide in aryl hydrocarbon receptor deficient mice. Biochem Pharmacol 2015;98:484–492.
. Upregulation of costimulatory molecules induced by lipopolysaccharide and double-stranded RNA occurs by Trif-dependent and Trif-independent pathways. Nat Immunol 2003;4:1223–1229.
. Tubulin polymerization promoting protein (TPPP/p25) as a marker for oligodendroglial changes in multiple sclerosis. Glia 2010;58:1847–1857.
. Signaling to NF-kappaB by Toll-like receptors. Trends Mol Med 2007;13:460–469.
. Unresponsiveness of MyD88-deficient mice to endotoxin. Immunity 1999;11:115–122.
. Role of adaptor TRIF in the MyD88-independent toll-like receptor signaling pathway. Science 2003;301:640–643.
. Glatiramer acetate treatment negatively regulates type I interferon signaling. Neurol Neuroimmunol Neuroinflamm 2015;2:e179. doi: 10.1212/NXI.0000000000000179.
. The neurotoxicant, cuprizone, as a model to study demyelination and remyelination in the central nervous system. Brain Pathol 2001;11:107–116.